The wheel is a crucial component of the roulette game. Even the term 'roulette' itself means 'small wheel' in French. According to the number of pockets on the wheel we differentiate two types of the roulette game - European with 37 pockets (36 plus one zero) and American with 38 pockets as it includes single zero and double zero. But the arrangement of numbers on the wheel is different in European and American variants of the game. Red and black numbers change in turns, and are placed opposite each other. Two odd numbers usually are changed by two even numbers. The two zeros in American roulette are also placed on the opposite sides of the wheel in green pockets. All numbers face the outer side of the wheel. To the right from zero nine red numbers and nine black ones are placed - 2-4-6-8-10-11-13-15-17 and 19-21-23-25-27-30-32-34-36 correspondingly. Black numbers are low and red ones are high. To the left from zero nine black and nine red numbers are placed - 20-22-24-26-28-29-31-33-35 and 1-3-5-7-9-12-14-16-18 correspondingly. Here black numbers are high and red ones are low. The numbers face the inner part of the wheel. 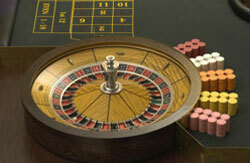 The roulette wheel itself consists of a bowl and the tilt or wheel head that spins and is well-balanced. According to the rules of the game the wheel is spun counterclockwise and the ball is launched clockwise so that it spins in an opposite direction to the spin of the wheel. Then the ball loses speed and draws closer to the center as it collides with different bars on the track of the wheel. As the ball reaches the center where the head is situated, it finally falls into one of the pockets and so determines the winning number. The layout is an area on a roulette table usually covered with green cloth. The table layouts for European and American roulette are basically the same except that the layout in European roulette has one zero while in American roulette there are two zeros ('0' and '00') situated next to each other. In general, the roulette table layout is divided into two sections corresponding to the two kinds of the bets - inner section and outside section. Inner section represents each number on the wheel, whereas outside section consists of the certain areas corresponding to even and odd numbers, red and black color, columns and dozens (1st 12, 2nd 12, 3rd 12 ) or low (1-18) and high (19-36) numbers. While in American and European roulette only one side of the table is available for the players, in French roulette table layout gives access to both sides of the table with the croupier occupying the area near the wheel. It makes the French table layout wider. Also, the croupier or a stickman use a stick to clear the table off the losing chips, thus making the game procedure slower that in other variants.